In a twelve-month period that has already seen us mourn the loss of Pinetop Perkins and Hubert Sumlin, American blues and roots music has lost one of the last undiscovered treasures of blues music. Tom “Pops” Carter passed away late Sunday in Houston. Carter, who was 92, made the unlikely transition from elder bluesman to icon and darling of the college music scene in Denton, Texas – a town often referred to as “Little Austin.” In the course of his career, Carter played with a “who’s who” of blues musicians such as B.B. King, Lightnin’ Hopkins, Clarence “Gatemouth” Brown, Freddy King and Little Milton. Carter developed a unique style which fused Texas blues with influences from funk, soul, R&B and rock. He was also widely known for his fancy on-stage footwork, which remained a signature feature of his performances until well into his 80s. In the following years, Carter heard many of the great legends of early blues perform, including Lead Belly, Blind Lemon Jefferson and T-bone Walker. If Carter loved the blues, he hated picking cotton. Rather than submit to repeated beatings from his father for not working the family’s fields, one night Carter threw some belonging into a pillow case, snuck out the window and hitch-hiked to Houston to live with his aunt and uncle. In just a few years, Carter was already a fixture of the vibrant blues scene of Houston’s Third and Fifth Wards. His first band, the House Rockers, performed on the streets and outside clubs – often being run-off by club owners because there were more people outside the club than in. 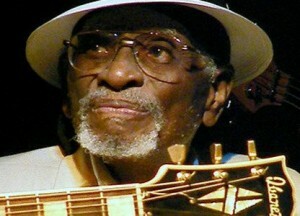 By the 1950s, Carter had already begun to meet and play with many of the most influential bluesmen of the era. His relationship with Lightnin’ Hopkins, however, would go on to impact him personally as well as artistically – when Hopkins introduced him to his first-cousin, Minnie Lee. Carter recounts that on first meeting her, “She was telling me about all these men who done her wrong. And I said, ‘Mama, I can treat you better than that.’” Although Carter died a widower who was married five times, Minnie Lee, who Carter referred to as “Mama” throughout his life, was the love of his life. In addition to his music, Carter worked “straight jobs” throughout most of his life. In 1969, a construction job took him to Denton, Texas. Carter, who had always preferred small towns to big cities and enjoyed the energy and creativity of the college town, was instantly smitten. He decided he never wanted to live anywhere else. Over the next four decades, Carter became a fixture of the local music scene, serving as friend and mentor for two generations of local musicians. Among the musicians with whom Carter played at the time was a young Stevie Ray Vaughn who, still making a name for himself, would sometimes travel from Austin to play at the dive bars around the University of North Texas. Beginning in the early 80s, Carter served as front man for local band The Funkmonsters. Together, the outfit developed a unique blend of roots-music attitude and college music aesthetic, all punctuated by Carter’s high-energy dancing. 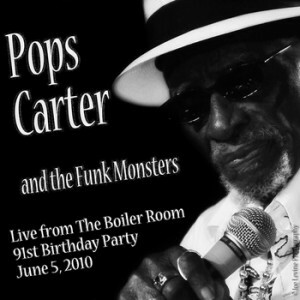 Although he formally “retired” a few years ago, Pops Carter and The Funkmonsters continued to gig periodically. Regrettably, one other parallel between Carter and many other early-generation bluesmen is a dearth of recorded material. A handful of sides recorded for Duke-Peacock’s Don Robey in the 1950s have never surfaced. With the Funkmonsters, Carter had one local CD release in the late ‘90s. As a final tribute to the elder bluesman, the Funkmonsters have made available a 12-track online album (with all proceeds going to help defray the cost of Carter’s funeral expenses). As an added bonus to blues fan, the album features the guitar talents of Texas Slim. The album is available to download for $5 (larger donations welcome) and tracks can be listened to for free HERE. Like the other bluesmen that have passed in recent months, the death of Pops Carter hails the end of an era – when the world loses not only these amazing musicians but our living connection to the genesis of what would become America’s (and the world’s) popular music. Let us celebrate their legacy while we can.